Try this deliciously indulgent dessert - once the preparation is done, they are surprisingly easy to make. Place the butter, sugar and orange juice into a bowl over a pan of simmering water and stir until the sugar has dissolved. Remove the bowl from the heat and allow to coll a little before adding the beaten eggs, then return to the pan of simmering water and cook until thickened, stirring continuously for about 20 minutes, or until it coats the back of a wooden spoon. Spoon the curd into a clean bowl, cover the surface with clingfilm and chill until needed. Preheat the oven to 220°C, gas mark 7. Dust a clean surface with icing sugar and roll the pastry out to the thickness of a pound coin and about 20 x 24cm in size. Trim and cut into 12 rectangles, each measuring 5 x 8cm. Arrange these on a lined baking sheet and dust with the cinnamon. Place another piece of baking parchment on top followed by another baking sheet and transfer to the oven. Bake for 15-20 minutes until crisp and deep golden, removing the top baking sheet and parchment for the final 5 minutes. Remove from the oven and allow to cool completely. Whip the cream until it forms soft peaks and spoon into a piping bag. Split each pastry horizontally into 2 so you have 24 rectangles. Spread the orange curd over 16 of the pastries and pipe 6 blobs of cream on each. Place one on top of the other then top with the remaining pastries so you 8 mille feuille each with 3 layers. Store any remaining curd in a jar in the fridge for about 1 week. 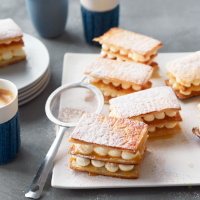 Dust the mille feuille with icing sugar and serve.